You would not have thought it possible, but those brilliantly clever people at History Heroes set themselves one heck of a task, and managed to being it off with flying colours. They have brought to the families of Britain (and the rest of the world, too) over 1,000 years of history presented in the form of a quiz for all the family card game. It covers Explorers, World War 1, Sport and Scientists, each in their own set of playing cards. The cards are not small, yet nor are they too big (11.8 x 7 x 1.8 cm) and they are well printed and each pack of cards covers a wide range of subjects. For example in the Scientists pack you'll find information about Archimedes (c287-112BC, John Dalton 1766-1844, Edward Jenner 1749-1823, Alan Turing 1912-1954 and many more, besides. What is the aim of the game? To capture as many of the cards as you can within an agreed time, all of them if you can manage it. You shuffle the pack, deal the cards equally and then fun begins. The game is not a game of chance, you must use the information on the cards in order to try to win as many of your opponent's cards as you can. 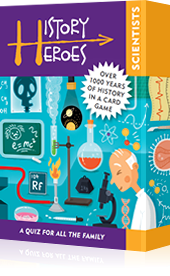 You can also use them as flash cards to learn facts about the great scientists, explorers, sports people and about World War 1. It is ideal for all ages and will be highly useful for parents who are self-educating their children at home, or who want to help their children learn more about history in a pleasant, fun and interactive way. Don't worry, full instructions are included with each pack of cards. Each pack in the series costs a reasonable £8.99 and should keep the family happy and quiet (well... sort of quiet!) for hours of fun learning. You can order the cards online at the official website https://www.historyheroes.co.uk. That's Christmas and its Team of Testers would like to thank the PR folks & independent suppliers of food and drink products and Christmas gifts who assist us in testing products for That's Christmas by providing items, gratis. Got a product that you'd like featured here, for free? Please email thatschristmas@mail.com. Last minute Christmas shopping here! Resolve to say "No" to New Year Resolutions! A White Christmas in Plymouth! Happy St. Stephen's Day, everyone! Views on that's Christmas are up! It's a gift, Jim! But not as we know it! Don't forget the Perrier Water this Christmas! Dom't forget Pukka herbal teas over Christmas! How to beat the temptation to present pinch! The ultimate action toy for Christmas! Everyone loves New Baileys Mini Delights!